The Danish series builds out an intriguing dangerous world for its main group of survivors, but doesn't exactly know what to do with them. Realizing that the one thing you need to survive is also the one thing that can kill you is a daunting prospect. It’s the basic foundation of many a sci-fi dystopia, whether they take place in space, on earth, or in some other mystical realm. “The Rain,” the latest Netflix original from Denmark, tweaks that question: What if some light precipitation could be the thing that wipes out all of humanity? For Simone (Alba August) and Rasmus (Lucas Lynggaard Tønnesen), two teens who escaped a cataclysmic, Scandinavia-wide downpour, the answer means spending the better part of a half-decade inside a secure bunker, away from that unfiltered rain. Like most other elements of “The Rain,” their method of survival seems more complicated than it actually is. The last thing piece of advice their father gives them before heading above to an uncertain world is to…survive. After a safe time below to wait out the effects of the deadly rain-borne virus systematically destroying civilization, the forces that push them to leave are effective building blocks in creating a world where humans have largely been extinguished. It’s near impossible for “The Rain” not to exist in the shadow of other shows that have imagined what the world would be like without us. But as later seasons of “The Walking Dead” have shown, when a show defines itself by what it doesn’t have, there’s always a danger that preserving that status quo means going against everything that makes TV worth watching. 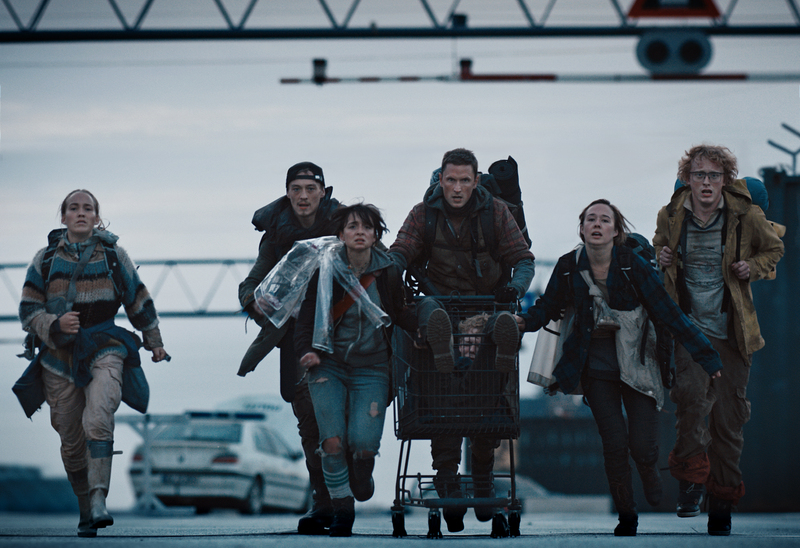 By nature of a dwindling food supply and some sloppy investigation of the world outside, Simone and Rasmus eventually find themselves in a slightly larger group of survivors. Led by ex-military man Martin, this roving band of foragers is a ragtag group bound by little more than their common desire to survive. The show does its best to give each of these individuals a distinct path that led them to the series’ present, but the “Lost”-style approach to the series’ flashbacks creates a narrow window of understanding of this pack which still keeps them as a random assortment. Apocalyptic scenarios like this have a way of stripping down characters to their basic elements. Even with plenty of downtime as the group wanders from new home to new home, the heightened need for survival tends to force out most of what could make “The Rain” feel like something other than a show moving from checkpoint to checkpoint. Martin’s new group is mainly a collection of functional pieces: shy Jean (Sonny Lindberg), rebellious Beatrice (Angela Bundalovic), enigmatic Patrick (Lukas Løkken), and jokester Lea (Jessica Dinnage). If there was an awareness that Martin and his group were just interchangeable parts in a survival machine (like the air filters in the bunker), “The Rain” would have something to offer beyond brute survival. Once those tracks are established, the framework of “The Rain” isn’t really designed to give its downtime over to some enlightening bits of character work. That extra time is often left for some way to work out where the group is and where they need to go next. The show occasionally does make time for those tiny bits of rediscovering humanity, whether it’s two people improvising a ping-pong game, a brother and sister having a mini dance party, or joking about what someone owes at a retail store. Credit “The Rain” for not using an oppressive lack of hope as a means for raising stakes, something that more than a few shows on TV are using as a fundamental part of their DNA. Despite the limited human scope of series, the design of this post-human Denmark is impressive in its scope. Entire cities are imagined in ghostly abandoned detail, not just sticking to highways with driverless cars strewn about. Burnt-out fast food storefronts and the logistics of a series of corporate research bunkers are items in a list of the eerie subtractions and additions that build out the consequences of a widespread epidemic. It’s counterproductive with a show like this to dissect the logic of how this disease got spread or to what extent water vapor is fine while stepping in the river is not. That doesn’t change the fact that like a group of undead brainless hoards popping up at the whims of the writers’ room, this ultimate inanimate adversary only seems to appear when there’s a need for conflict. Absent is the campy, over-the-top disaster movie appeal of something like “The Day After Tomorrow.” Instead, “The Rain” treats every slow-moving raincloud like a motivated killer stalking its prey. The closest any of these performances come to getting the full range of fear, resiliency, and vulnerability is Mikkel Boe Følsgaard as Martin. In both timelines, as a pre-outbreak sniper and a default captain after, Følsgaard turns Martin’s frustration into a playing a conflicted leader who’s desperately trying to maintain an image of control for himself and his crew. His solo flashback is the one that best gets across the severity of the virus and the lasting psychological effects it has had on those that survived it. Despite his best efforts, for a show where humanity is under attack, you ultimately need a reason to root for at least most of the humans. “The Rain” never gets to the point where you’re pulling for the water droplets, but this is one barren wasteland that makes it difficult to care about anything other than surviving it. “The Rain” is available to stream on Netflix.